The early 1980s were disastrous for Nelson. The local sawmill ceased operations, followed by the university, eliminating nearly 1000 jobs in a town of just 10,000 people. But those events also spurred innovation. Baker Street was home to hundreds of historic structures in need of restoration, so the drive to revitalize the downtown took off. By the mid-80s the entire street had a new look. The area is now a bustling centre of activity, no matter the season. Cafes and restaurants spill out onto the sidewalks, shops are busy, and there are ample places to park your bike. This might explain why Nelson has more than three times as many commuters who walk or bike to work than the provincial average. Like most other cities and towns in North America, Nelson’s population includes people who struggle with mental health, addiction, and homelessness. To create a more coordinated, caring response, Nelson Street Outreach was launched. This multi-disciplinary group consists of members from the social service sector, business community, municipal police, faith community, school district, health authority, local college, and local government. A small street team engages with people to monitor individual situations, direct them to resources, act as mediators with police, and provide emergency food, water, clothes, and care when needed. The project is currently entering its third year of operation. We were going to fill this space with a shot of our twice-weekly farmer’s market and talk about our awesome local organic food culture, but with summers getting longer, hotter, and drier, the threat of wildfire has become a province-wide concern. After a study identified Nelson as the most at-risk community over 10,000 in western Canada, the city has begun working on a broad range of strategies to mitigate fire threat, create an actionable whole community emergency operations plan, and build capacity to respond, and if necessary, rebuild. Nelson has long been home to a great arts scene. The most recent addition is the Nelson International Mural Festival, now entering its second year. The first year invited a selection of international, national, and local artists to create 8 murals throughout the downtown. The mural above was created by local artist Kelly Shpeley, painted on the rear wall of Nelson’s hugely popular Capitol Theatre, which was lovingly restored by volunteers in the mid-1980s. Hoboken Coffee Roasters was once an abandoned garage until Trey and Mallory used their life savings and passion for well-crafted coffee to make their dream a reality, one subway tile at a time. Hoboken represents slow, incremental development on a human scale. And is one of Guthrie’s most treasured places for people to gather. Guthrie’s turn of the century Victorian architecture is so ornate it can only be fully appreciated on foot or bike. Guthrie looks for every opportunity to close streets so pedestrians and cyclists can feel even more at home. The American Dream is alive and well in Guthrie, picket fence included. Families of all ages can find affordable places to live within walking distance or a short bike ride from downtown. Free range kids and chickens are welcome here. 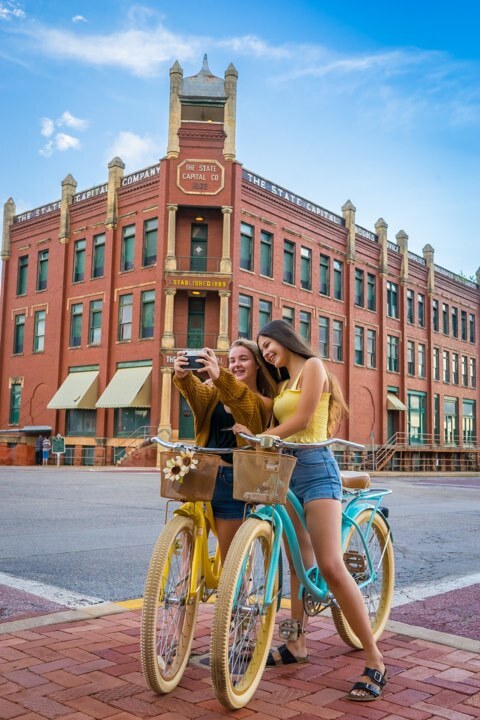 Original red brick streets pave the way through Guthrie’s walkable village and National Historic District, the largest in the U.S.. Guthrie’s land use is so efficient you can get almost all of your daily errands, shopping, and entertainment needs met within a four block radius. The Boarding House, Oklahoma’s first board game lounge, plays host to some of the coolest kids in America. Families in Guthrie put down deep roots and instill the values of hard work, friendship, and being real.